Home » 2011 Minutes » MARFC on the dirt at Merritt Raceway! MARFC on the dirt at Merritt Raceway! July 23rd Board members Bill Walters and Dennis Trinklein made the terk to the Merritt Raceway for some outstanding dirt racing. Upon arrival to the raceway club members were treated to a VIP wrist band seating up grade by promoter Rick Ancel. Thanks Rick for all your support of the club and it’s members. The MARFC Uniform/ Helmet Bag was presented to three ladies, Kara Cade, Cheryl Erickson, and Nora Erickson who have donated their time in heading up prizes and games for the annual Wood Tic Kids which is part of the Wood Tic weekend event. 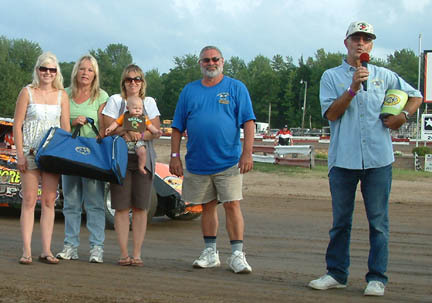 Our MARFC members raffle winner was Diane Hilliker wife of UMP # 21 Modified driver Steve Hilliker. Many Thanks to “The Chief” Lego Pego and Alan Lardie for their great PR work for the club all night long. Previous post Mt. Pleasant Speedway Hosts Fan Club Day! Next post MARFC at Winston Speedway!